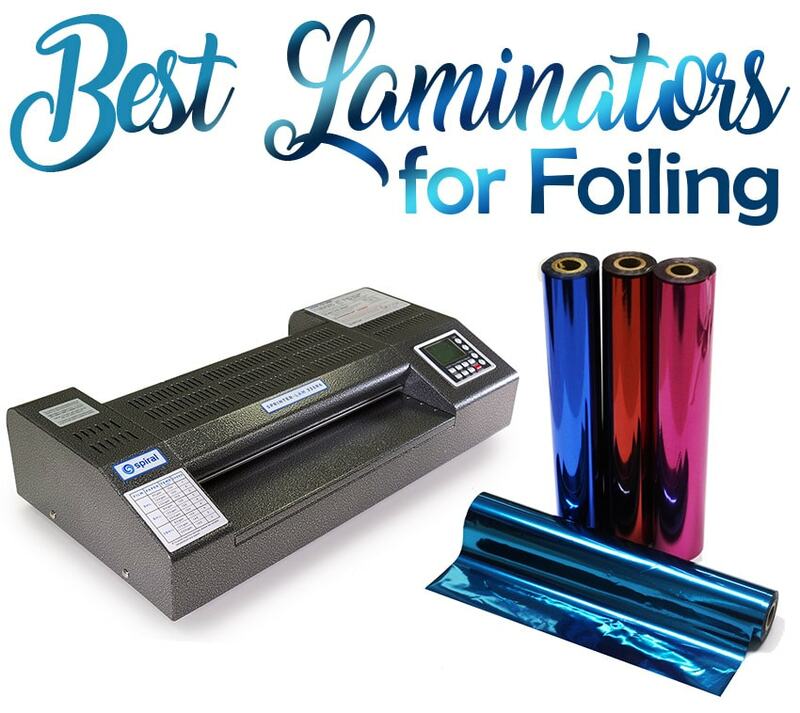 What are the Best Laminators for Foiling? The best laminators for foiling will have a couple of things in common: they will have adjustable heat settings that will reach a minimum of at least 300° F, they will have adjustable speed, they will have heat rollers instead of heat plates, and they will have the capacity to handle thick lamination pouches of at least 10 mil. Before we start, let's swoon a bit over some of the gorgeous foiling I have done using the SpeedyLam (the 1st laminator I list below) that we keep in our office, so you can see some fun inspiration for the kinds of foil prints you can make with a pouch laminator and our toner reactive foils. The SpeedyLam 330R is a top of the line pouch laminating machine that produces perfectly foiled documents, even when printing thinner text. The adjustable heat and speed settings let you tweak it to fit your foiling need perfectly. This is important because the amount of heat, and the length it stays heated, will vary a bit depending on the paper stock you have printed on, and even the kind of foil you are using (for example, transparent foils tend to need a bit more heat/longer time to adhere best). And a bonus? It is incredibly fast (hence the name)! In fact, it is the fastest tabletop pouch laminating machine in it's class, running at speeds up to 12 feet per minute while still producing the highest quality output. This is actually the pouch laminating machine that we keep in our office for staff use, so I get to play with it all the time...and I love it! It is truly an awesome piece of lamination and foiling heaven, creating perfectly laminated photos, prints of many kinds, as well as ultimate foil laminating. Click here to check out the SpeedyLam or to buy it online. Taking a step down in price, the Sprinter-Lam 335R6 is made by the same manufacturer as the SpeedyLam, Spiral. They make these premium lamination machines that outshine any other brand that I have tried. Even the SprinterLam, which retails at less than half the price of the Speedy, is a fantastic laminator for foiling (and laminating!). This machine is also super fast, running at up to 3 ½ feet per minute, and has all of the adjustable settings you need to achieve the most solid foil. 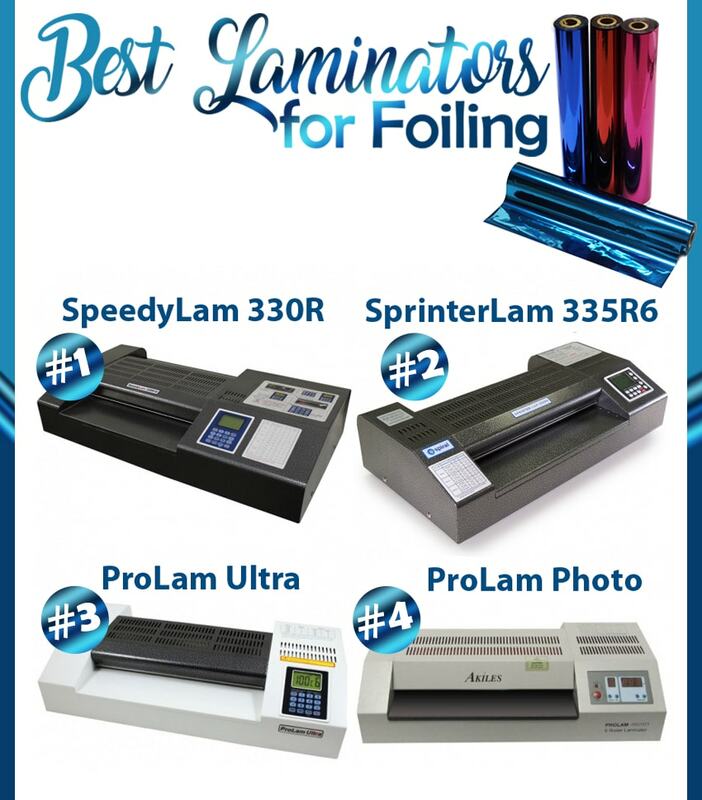 Another bonus feature of the SprinterLam 335 pouch laminator is the ability to store 2 programs into memory; so once you tweak the heat and speed settings for a specific kind of paper stock and foil that you use most often, you can save that setting for quick-recall the next time you need to foil. Click here to learn more about the Sprinter-Lam or buy it online. The ProLam Ultra is made by a different manufacturer, called Akiles. They are very well known for their paper finishing equipment, including their pouch laminating machines like this one. It is a tad less expensive than the SprinterLam, while still offering the adjustable heat and speed you need to foil with a laminator. Specifically designed for working well with traditionally hard-to-laminate photo paper, it is a great choice for foil laminating because it has that premium quality and full 6 roller system for even, consistent heat from the front of your page, to the end of your page. Click here to learn more about the ProLam Ultra or to buy it online. Also manufactured by Akiles, the ProLam Photo was another lamination machine specifically designed to work with thicker photo papers and heavy ink covered sheets, making it a great foiling laminator. It may not be the prettiest machine, but that doesn't take away from its ability to make really beautiful foil lamination prints. It meets all the needs I mentioned above to produce a high quality foil, without breaking the bank. Click here to learn more about the ProLam Photo or to buy it online. The four laminators I have discussed are on-budget for offices and businesses of many sizes, but what about for individuals users and crafters who want to foil at home? Will laminators not meeting these specifications work? Sure! It is definitely possible that other lamination machines will work; we have some customers who use small laminators from a craft store with 1 heat setting who simply run their foil through 2-3 times until the proper heat is applied, and other customers who even just use a household iron (I can't wait to try this method!!!). You can achieve the process of foil laminating without one of these laminators by getting creative with a heat source, as long as you always do so safely. But for the highest quality, and most solid and secure foil, using one of these machines that have been tested and approved as some of the best laminators for foiling, will be your best bet. Before you go, make sure you check out my Everything You Need to Know About Foiling blog post where I discuss all of the supplies and tools you will need, as well as dig deeper into toner reactive foil itself, and some different methods for how to foil. You can also check out this blog post about creating a wall print with toner foil, where I walk you through the steps and offer troubleshooting tips and tricks to get the best foil lamination. Or if you're tired of me blah-blah'ing, and ready to get started, click here to buy toner foils.